Dietrich senior Bailey Hubert gets smacked in the face by Carey junior Bailie Morey as Hubert goes for a layup Saturday, Feb. 2, 2019, at Shoshone High School in Shoshone. Minico senior Claire Boettcher is fouled by Burley senior Quinlyn Ontiveros on Thursday, Jan. 31, 2019, at Minico High School in Rupert. Buhl's Kyra Azevedo is guarded by Filer's Ella Fischer during the District IV Tournament Tuesday night, Feb. 5, 2019, at CSI in Twin Falls. Declo's Mattie Ramsey brings the ball up against Valley during nonconference play Thursday night, Jan. 24, 2019, at Valley High School near Hazelton. Shoshone's Ari Regalado brings the ball up during their game against Valley Monday night, Feb. 4, 2019, at CSI in Twin Falls. Murtaugh's Jenna Benites knocks the ball loose from Carey's Kylie Wood (23) during 1A Division II championship game Wednesday night, Feb. 6, 2019, at Shoshone High School. Dietrich senior Brianna Astle ties to drive the ball to the net Saturday, Feb. 2, 2019, at Shoshone High School in Shoshone. On Thursday, six Magic Valley high school girls basketball teams will head to either Nampa or Boise and begin their quests for state titles. Some were expected to make it to this point, while others weren’t. All of the teams finished either first or second in their respective district tournaments to notch state tournament births across five different classifications. The Spartans have had plenty of adversity to overcome this year, following a season-ending injury to senior point guard Taycee Harper, and they’ve done it in pretty impressive fashion. 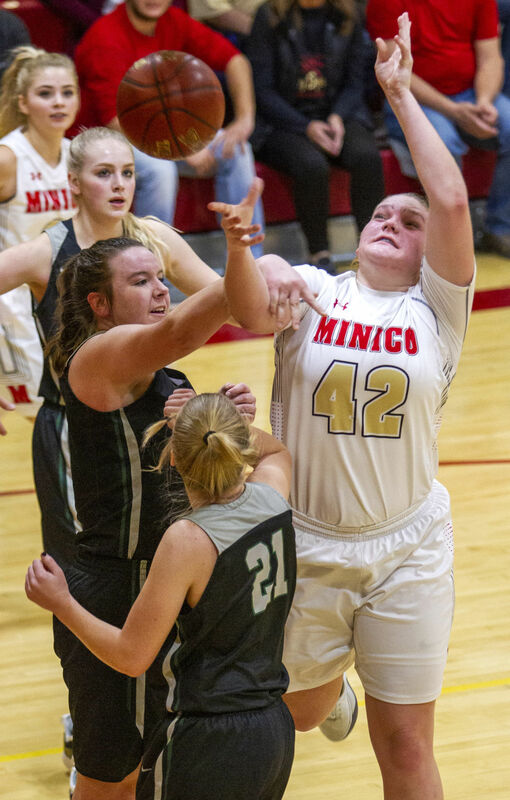 Senior Taylia Stimpson, a College of Southern Idaho signee, has been the leader for the Spartans, while players like junior Bailey Black, senior Claire Boettcher and more have done their part in helping Minico put together a solid season in the difficult Great Basin Conference. The Spartans opened the season among the top five teams in the state, according to the state media poll, but dropped out and were unable to return at the end of the season. Still, they ended the season on a strong run, winning five of their final seven games, with their two losses coming to 4A’s No. 1 team, unbeaten Century. For a team that has won the last two 4A consolation championships, the Spartans will hope Thursday’s 8 p.m. contest against Hillcrest at Timberline High School in Boise kicks off a run toward the program’s first state championship. Buhl had one of the most impressive district tournament runs of any team in the area. After failing to win a single conference game during the regular season, the fourth-seeded Indians upset top-seeded Gooding, then beat Filer twice in three tries to claim the district title, which was their second in a row. Senior Emily Gorrell averaged more than 20 points per game during that stretch, and she’s the Indians’ go-to offensive player, while seniors Kyra Azevedo and McKenna Lively will be looking to make their mark, too. The Indians only allowed more than 40 points once in their final eight games, finding a defensive rhythm that they’ll hope can carry over into their second consecutive state tournament appearance. Buhl has quite a bit of momentum, and Thursday’s contest against Homedale at at Skyview High School in Nampa at 3 p.m. would be a good place to keep it going if the Indians are going to claim their first state title since 1997. In the two-team Canyon Conference, Declo topped Wendell twice in the regular season and twice in the postseason to lock down a trip to the state tournament. The Hornets defeated the Trojans by more than 20 points in each game. The Hornets have relied on the Ramsey duo, with senior Mattie Ramsey and junior Sydney Ramsey providing Declo’s offensive spark for much of the season. Juniors Brooke Olsen, Katelin Mallory and Amanda Bott have also made a big impact this season. With few 2A opponents in the area to face, Declo heads into relatively untested waters, although the Hornets impressed while playing some bigger schools, defeating three different 3A squads over the course of the season. After failing to make last season’s tournament, losing the state play-in game to New Plymouth, Declo will hope to make a splash in this year’s edition, starting with its opener against West Jefferson at 1:15 p.m. on Thursday at Bishop Kelly High School in Boise. The Indians won their second consecutive district title after a dominant regular season, during which they held the No. 2 spot in the state media poll throughout. Their championship win over Valley, in which they were down four points at halftime, included the Indians limiting the Vikings to just seven second-half points. Five seniors make up Shoshone’s starting lineup, as Cierra Hennings, Bailee Owens, Patti Fitzgerald, Ari Regalado and Rionna Kerner are all set to use their experience to lead the Indians throughout the playoffs. Shoshone’s defensive abilities were on display throughout the season, as the Indians allowed more than 40 points just twice and 30 points only five times, while, five times, they held opponents to fewer than 20 points, including a Jan. 17 contest in which they allowed just nine points to Glenns Ferry. The program has two state titles, including one under current 28th-year head coach Tim Chapman, back in 2005. They’ll begin their hunt for another on Thursday at Columbia High School in Nampa, where they’ll take on Liberty Charter at 1:15 p.m.
Carey went unbeaten in Sawtooth Conference play over the course of the regular season, then won three straight in the district tournament to take the title and earn its spot at the state tournament. Sophomore Kylie Wood has been the player the Panthers have relied on most for points this season, but they have a strong senior group that includes Lindsey Morey, Kodi Green and Athana Versis, with every player capable of stepping up if needed. Carey’s only loss of the season came to Shoshone in its third game, way back on Nov. 20. Since then, the Panthers have won 17 contests in a row, moving from unranked to No. 2 in the state media poll, even receiving some first-place votes in the final two weeks. The Panthers have made the consolation finals in each of the last two tournaments, but, on at 8 p.m. on Thursday at Nampa High School, they’ll look to head in the other direction with a win against Rockland. A perennial state title contender, the Blue Devils were on the brink of failing to make the state after a district semifinal loss to Carey, but beat Camas County, Hagerman and Murtaugh to clinch a spot in the tournament. The senior trio of Matigan Bingham, Brianna Astle and Bailey Hubert have led the way for Dietrich, while junior Caylee Dillworth has also been a strong presence in the post for head coach Acey Shaw’s team. Dietrich found its way into the state media poll a few times, but ended the season on the outside, looking in. Still, the Blue Devils had an impressive campaign, relying on an effective offense that topped 60 points on five different occasions during the year. If they get anywhere at state, it’ll likely be down to the outside shooting of Bingham and Astle, along with strong play down low from Hubert and Dillworth. Not too long ago, the Blue Devils were like royalty, winning four straight titles from 2011-2014. They last made a championship game in 2016, and will start their hunt to return to that stage on Thursday at 3 p.m. against Salmon River at Nampa High School.